Circle farming is practiced extensively where growers use center Pivots. It is a practice that reduces run-off, which is a problem for center Pivots on sloping and clay loam soils. Circle farming holds water where it’s needed. Water movement in the furrow between two crop rows of clay loam, silty clay loam and other soils that have low intake rates, is minimized, and often prevented, with furrow dikes, ripping, subsoiling and other tillage practices. Tillage that helps hold water is an integral part of LEPA irrigation, especially on tighter soil with slopes of more than 1%. Water application rates are greater with LEPA because at least half the soil surface is not wetted. Circle farming begins with marking the circular path the center Pivot will folow by making a revolution without water. Next, figure out the number of rows and row widths that correspond to the span length of a Pivot section. For instance, fourty-eight 40-in. or sixty-four 30-in. rows match evenly with 160 ft. long spans, and seventy-four 30-in. rows match up with 185 ft. spans. Some drivers position the tractor wheels on the center Pivot wheel track the first pass, then make additional passes on each side. This puts the center Pivot wheels between two crop rows. True, circle farming is different at first. Yet, it hasn’t prevented many growers from taking advantage of the benefits. 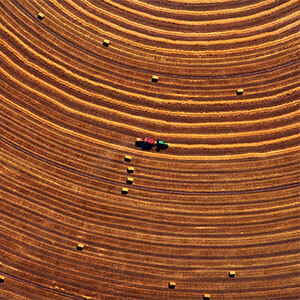 Driving in the first span of the circle is often more difficult, but the crops go in each year. It is easier and better each try. Exactness is not essential either, even with LEPA irrigation. A LEPA drop hose is flexible and is pushed to the side by crop leaves, especially in corn. The hose and head can temporarily drag over the crop in one row, then cross over if needed. When crops are planted in a circle, the center Pivot never dumps all the water in a few furrows as it can when it parallels straight planted rows. Intense rainfall may cause more erosion in circle farming, but the dry furrow using LEPA helps. One response to "Circle farming"
I travel around many countries on business and I see crops irrigated with Pivot systems and it is in the United States where we make the least of the corners of fields that the circles drawn by central Pivots miss. Using these areas is not as cost-effective as in other countries that have less land.